"Non nobis Domine, non nobis, sed nomine tuo da gloriam." - Not unto us Lord, not unto us, but to thy name give glory.For all that the Templar Knights have done in the name of God and all they are known for, that Glory of God must have been and continue to be made all the greater. 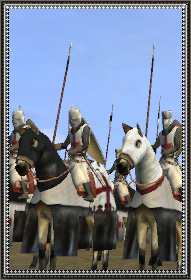 Highly disciplined and trained, they are amongst the best knights the Crusaders can field. First upon the battlefield and last to leave, if at all, Templar Knights are best utilized in the vanguard of the charge, opening a breach in the enemy line for their comrades to follow. Such zeal does have its drawbacks, for the Templars are so keen on the destruction of the infidel that in battle, their foes destruction may matter more than their own survival.